Yesterday morning, we left the safety of Sukothai Hotel, a swish, five-star oasis in Sathorn (and right in the middle of the battle zone) to move to another hotel which is slightly at the edge of all the fighting. This is the first time most of us have left the hotel grounds and into the outside world since Friday morning. Sathorn, one of the major thoroughfares in Bangkok’s central business district, was eerily quiet. I’d heard some really loud bangs the night before around 11 in the evening while walking towards the hotel gate – they did not sound like automatic gunfire, they sounded like serious explosions, coming off one after another. I walked for no more than 5 minutes along the drive way and yet I heard at least 10 explosions almost consecutively. Reports and tweets were coming in of heavy gunfight around Lumpini area, near my flat. It wasn’t a nice feeling. In the morning though, it was all clear, and ours was the only moving vehicle along the massive driveway. We turned left (we were on a minibus) and the first thing we encountered was a military checkpoint. We passed through it – made of barbed wires and a dozen or more soldiers in full gear with what looked to be M16 on their shoulders – easily enough, and they didn’t give us any trouble. But as we drove on the Sathorn road, the evidence of the past few days of urban warfare became clearer. There were scorched marks on the concrete road (remnants of the burning of tires on the street in the last few days), overturned phone booths and general debris. A group of soldiers were sleeping on the right of the driveway to the Met Hotel (another posh place), finally taking a rest. We’d been holed up in the hotel for three nights. I haven’t been back home for a week, since last Wednesday when the government announced plans to cut electricity and water in the protest areas, where my flat is located. By Thursday night when a rogue Red Shirt general was assassinated by a sniper fire, things had gotten so bad, some of my colleagues were trapped in our office while the army and Red Shirts raged battle in our car park – yes my office is also very close to the main protest area. The result? The office closed on Friday and we re-camped to the Sukothai, thinking this would all be over in a couple of days. Now it’s Wednesday and things don’t look like it will get any better. Reports of gunfire and sporadic fights are coming in every hour, my colleagues who are allowed outside (only war-weary veterans) are coming back with pictures of parts of Bangkok covered in thick black smoke from burning tires, soldiers shooting protesters and protesters throwing molotov cocktails and slingshots to soldiers. Regardless of which colour shirt you are and whose side you’re on, this surely has to be a very sad thing for Thailand and anybody who enjoys living and visiting Thailand. But the divisions have gotten so wide I wonder how long it will take to heal from this harrowing event. Some of my friends who live here say this is not the end, regardless of the outcome from this latest bout of clashes, that this is only Act 2 (Act 1 being the protests that has been brewing since March) and that Act 3 is not far away and sure to be even more tragic. So why are Thais killing Thais? There is not straightforward answer. But I’ll try and give my analysis of what has gone on and why. But first, some caveats. I’m not Thai myself but I have lived here for the past two years, it is the first country I have visited in my life over 20 years ago and my sister used to live here for 11 years. I have been coming here back and forth ever since, so I feel I know the country relatively well. Thailand is S.E Asia’s second-largest economy. Yet it also has the largest income disparities. And this is one of the reasons the Red Shirts are protesting – they are unhappy with the status quo where power is in the hands of the few, mainly elites and royalists. They have elected at least three governments since Thaksin – whom they broadly support – was ousted in a coup in 2006, yet all those governments have been stripped off power. The current PM came into power in a controversial parliament vote, not through elections. So they say Abhisit – current PM, Oxford-educated – and his cabinet is not legitimate, and they want elections. Now. The elites in Bangkok do not want to give way – they say the Red Shirts are terrorists and that mob mentality should not be allowed to determine who governs a country. Both sides are right to a certain extent, but they are also as wrong. The whole idea of mob rule, at least the recent definition of mob rule anyway, started almost two years ago with the royalist ‘Yellow Shirts‘ who staged sit-ins in the Government House to get rid of a Thaksin-backed government, culminating in the seizure of the airport in December 2008. At that time, the army didn’t listen to the elected government’s pleas to do something about the mob. They let the group of protesters seize the airport. Some of the leaders were charged and released on bail and they are still out there, free men. In fact, one of the Yellow Shirt leaders who spoke during their rallies is now the Foreign Minister in the current government. That whole debacle of the Yellow Shirt mob and the army’s blatant refusal to do its job opened a Pandora’s box, where governments can be pushed and shoved as long as you become a nuisance long enough. Sure, the Red Shirts are proving to be more militant than the Yellow Shirts but it helps to remember the origins for a bit of perspective. Also the Yellow Shirts, who call themselves People’s Alliance for Democracy, were calling for very undemocratic things, like abolishing the one-man-one-vote rule (as the poor people in the north kept electing people who supports Thaksin) and to fill the Parliament with more appointed officials than elected ones. Unfortunately, the Red Shirts seemed to have lost their aims of equality and democracy too. Part of the problem is that there are too many leaders, from the very republican hardliners to more doveish academics, so it is difficult to reach a consensus. 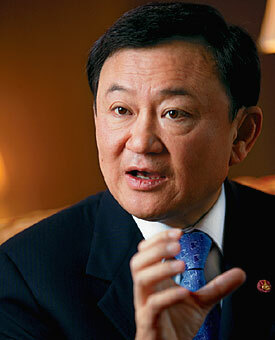 Besides, many people believe Thaksin, who regularly give rousing speeches via satellite, is behind all this. Thaksin, a populist PM much-loved by the country’s poor as well as the not-so-poor in the northeast, isn’t a persecuted innocent like others suggest either. However cynical you are of the Thai judiciary, Thaksin was well-known for his corruption as well as blatant disregard for human rights. During his reign, he was openly hostile to international media who questions his methods of dealing with the insurgency in the south (see below) and his business tactics while serving as a PM, and to NGOs. He caused the death of 78 Muslim protesters who suffocated at the back of a truck while being transported semi-naked to a destination 5 hours away, piled on top of each other. He also presided over extrajudicial killings during the notorious “war on drugs”. Human Rights Watch says 2,500 people were killed during one three-month period at the start of 2003. To many, he was well on his way to becoming a dictator. Unfortunately, what they got was another coup, a military government for the next couple of years and a constitution that detractors say is much less democratic than before. For this latest round of clashes, both sides could’ve walked away at any point in the past couple of weeks and avoided the deaths of so many civilians. But both sides – the leaders of the Red Shirts who said they were democratic and peaceful yet called on their supporters to burn down Bangkok as well as the Thai government who said soldiers only shoot at terrorists when photos proved otherwise – preferred to keep their power and money. More worryingly, there are so many people who think it’s a small price to pay. An example is an acquaintance who scoffed over the term ‘bloodshed’ – he said the death numbers less than 40 people and less than the number of deaths from traffic accidents during the New Year, so why are we making a fuss? In the next blog, I’ll try and talk about the heavy thrashing international media is getting from Thai social network users. Local photojournalists document the carnage. WARNING: graphic content! this is the karma of too much meat consumption. We reap what we sow.